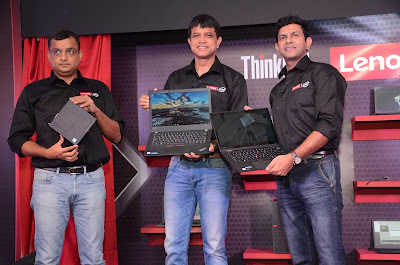 India – June 6th, 2017: Lenovo, the leading global PC and Tablet brand, announced the launch of its extensive 2017 Think product line powered by 7th Generation Intel® Core™ i7 Processors. The new 2017 range of ThinkPads, ThinkCentres and TIOs comes with significant technology breakthroughs making it an unparalleled portfolio of business machines. · Delivers up to 15.5 hours of battery life with a rapid charging feature that provides 80% capacity in just an hour. · The device can be used in different ways - with its 360-degree hinge, this 2-in-1 flips easily from laptop to tablet mode. · Designed to deliver outstanding performance and manageability – ThinkCentre M910 tower (TW) meets the most demanding content creation and multi-media tasks. *The above prices vary basis the configuration. Prices do not include tax or shipping or options and are subject to change without notice; additional terms and conditions apply. Reseller prices may vary. On-shelf rates may vary by geography and products may only be available in select markets. All offers are subject to availability. Lenovo reserves the right to alter product offerings, features and specifications at any time without notice.